University of Central Oklahoma students, faculty and staff set the world record for largest game of "Duck, Duck, Goose." More than 1,600 people participated in the game on Central's campus. More than 1,634 people participated in the game at Central’s East Hall Field. The previous record was for a game of 1,415 people, set by the University of Guelph in Ontario, Canada. 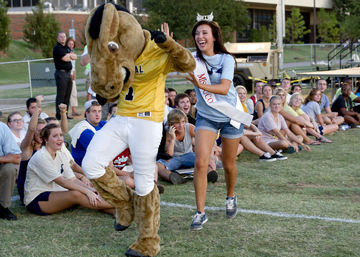 Celebrity players included new Central president Don Betz, Ph.D., Kathryn Gage, Central’s vice president for student affairs and Miss UCO 2011 Rachel Hill. Before Central can be penciled into the record book, Guinness officials must certify the results.